Sjosås Gamla Kyrka is a small 15th-century church on the outskirts of the village Braås, almost 30 kilometers north-east of the provincial capital Växjö. The basic structure of today's Sjosås Gamla Kyrka dates from around 1200 to 1550 with the sacristy as the oldest part from the first of the two predecessors. 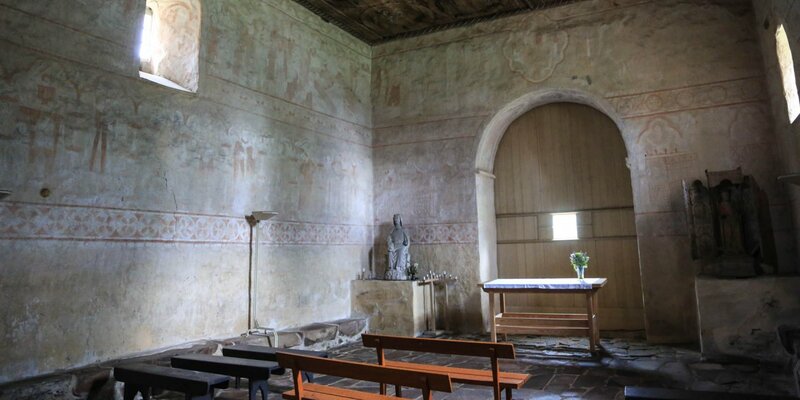 This first church, a wooden church with the masoned sacristy, was built at the beginning of the 12th century, followed by another wooden church built in the 13th century. 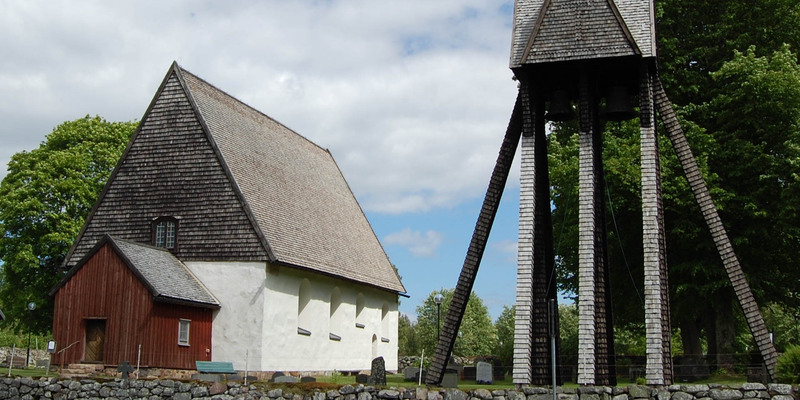 The church with its eye-catching steep shingle roof is a typical late-Gothic hall church without apse, picturesquely situated barely one hundred meters from the lake Örken. The wooden barrel vault inside the church is painted entirely with cloud motifs and tromping angels, while the upper part of the wall behind the altar represents the scene of crucifixion – accompanied on the left and right by the representations of the Annunciation of Mary and Moses with the Ten Commandments. 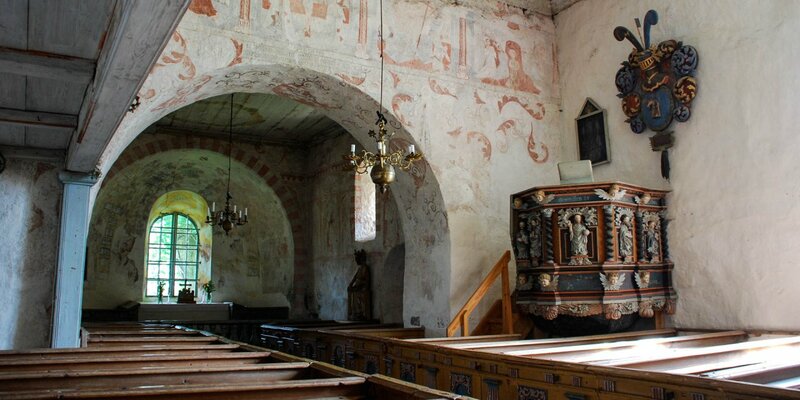 More paintings following on the surrounding galleries and also the church benches from 1639 are artfully painted. Among the oldest sacred objects in the church are the crucifixion group on the altar and the reliefs from the 13th century. 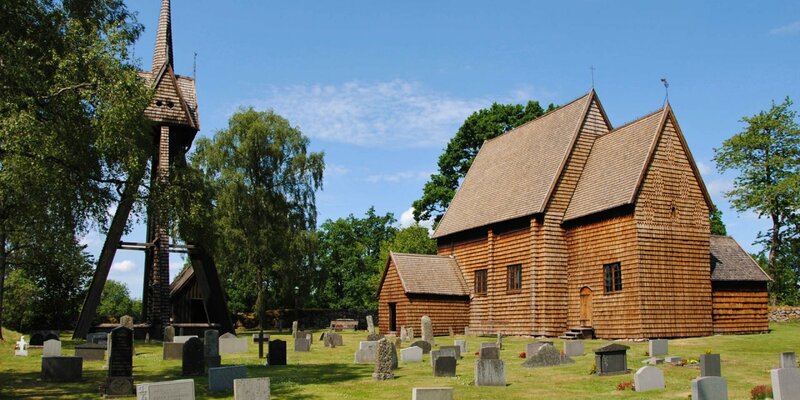 The church would no longer exist today without the intervention of local heritage association, which also operates the large homestead museum Braås Hembygsdpark. When a new church was consecrated in the neighboring village of Vias in 1865, Sjosås Gamla Kyrka was abandoned. After a thorough reconstruction by the heritage association, the old church was finally put back into operation in 1944.